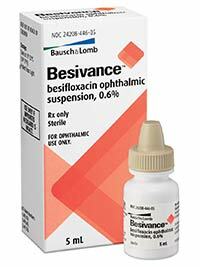 Besifloxacin 0.6%; oph susp; contains benzalkonium chloride. <1yr: not established. ≥1yr: 1 drop in affected eye(s) 3 times daily (4–12hrs apart) for 7 days. Shake bottle once before use. Not for inj into the eye. Avoid contact lenses during therapy or if symptomatic. Pregnancy. Nursing mothers. Conjunctival redness, blurred vision, eye pain/pruritus/irritation, headache; superinfection (discontinue and treat).